What Hardware For Backing Up? There are threads on how to back up and what to back up, but not what hardware is used. I am in the middle of ramping up production and will go through roughly 2TB of recorded footage every 2-3 months with nearly an equal amount in exported video. 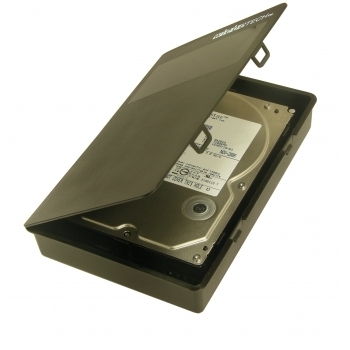 I have been using external eSata enclosures with Hitachi 2TB drives and now Seagate 5900rpm 2TB drives for everything - the number of drives is racking up and I want a better way of storing them. Because there is a rack for our playback server, I want to build a rackmount PC that stores up to 20 drives for backup and also to use as a Cinema 4D render node. Eventually, this PC can even be used as an editing workstation. The only problem is justifying the cost versus just replacing 4 2TB drives every 2-3 months and letting them sit on a shelf and rot. Another reason I want to move all these external drives away from my workstation is to prevent any possible damage that might come from being connected to the workstation. All data connected to a single PC is considered a single point of failure in my book, and that is not acceptable. With this rackmount PC, I want to use 2 Gigabit NICs and bond them for increased bandwidth. I do not want to use Raid because the drives would require special hardware (raid controller from same company) in order to be read. I want an archival setup where I can take any archived drive and just connect it to any PC. I will add LTO-4 by the end of this year; so, my plan is to make 2 copies onto tape and 1 copy onto HDD for archival. I need to keep only the current year readily accessible; so, in late January 2011, I can erase half of the backup drives, remove the other half and replace them with new drives. With that said, I am looking for what others use for backing up/archiving. PS I tried DVDs but its just a PITA with all this data. Last edited by Steve Kalle; August 10th, 2010 at 01:10 PM. My opinion, and I have only been in the business since 1994, ditch your hardware and go with a Drobo 8-bay Data Robotics, Inc. | Drobo Products system with 2tb 7200rpm Western Digital WD RE4 2 TB SATA Hard Drives ( WD2003FYYS ) drives and swap them monthly. I trust none other than WD! Unfortunately i believe that in consumer/business grade 2tb is all your realibilty going to get, meaning that you'll be storing some of these on the shelf, at the volume that you have indicated? Personally I would stay away from tape, they do and will degrade over time and become very unrelIable. Using something like the Drobo is exactly opposite of what I want. Those drives used in a Drobo can ONLY be read by another Drobo, and that is not a proper archive as it requires special hardware. With that much data you'll (or should) have some kind of redundancy and that is going to take either hardware or software? You talk about a workstation being a single point of failure yet you talking about building a single PC to drop in 20 drives, same point of failure. I am not a Drobo rep, but these things are solid, easy, and reliable - oh, and stackable. There are many different ways they can be configured, and if I am not mistaking, can be configures to read/write standard NTFS that is readable by a standard PC, should you have an emergency. Again, unless I missed it, I don't see where you talk about redundancy or any offsite storage? If the Drobo can read/write standard NTFS, then its something I will consider. Thanks for the tip. Can they be rack mounted? About redundancy, my workstation has a 10TB Raid 5 array with all data on it, and I have a home PC with some of the data on it as well for times when I want to work from home - now that I think about it, this will change. I just need to add several 2TB drives to my home PC so I can keep a copy of everything. Thanks again because I would not have thought of that if it hadn't been for your comment. Btw, you are the first person who says that LTO is not reliable. I guess every single large business is wasting money? I have been using some form of magnetic tape since they held about 256MB of data; so, its a lost cause trying to convince me not to use LTO - it is the only proper form of archival available. Hard drives 'rot' after prolonged non-use and burned DVD/BR start going bad after a few years. Sorry... It has been my experience that tapes fail, always have and always will; so do hard drives. Does that make tapes unsuitable for a backup - not necessarily, but in comparison to hard drives, they are a lot less reliable. It really depends on your archival needs - if the amount of your data was not so huge, I would suggest Solid State Drives for less chance of a mechanical failure. There is no perfect solution other than redundancy - sounds like you may have the figured out. Here is a thought - some of the "off-site cloud" services allow you to send them hard drives instead of using the Internet. You could send them a HD each month with the updates. They then have the responsibility of all the hardware & maintenance and to have the archive available on-demand. Just a thought. I use CrashPlan.com for my on site backup and off site disaster recovery for all my servers. In total I only have about 500gb. I have never used them for the amount of data that you are referring to, but there any many different companies that do the same thing and will accept hard drives (both ways). 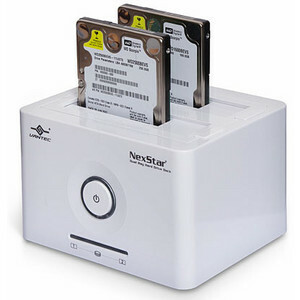 On the cheap, I'm a fan of just using bare SATA drives with a drive dock. Then shelving them in these plastic wiebetech cases. It's funny the cases kind of resemble old vhs/betacam cases. Take a look at the Firmtek solutions. I use Hitachi/IBM drives. If you want higher reliability, then spring for the Enterprise-Class drives. Otherwise, you can use mirrored RAIDs, along with RAID software that will warn you when a drive is likely to fail. I will continue to use the 2 eSata enclosures with 2TB drives to backup recorded video (xdcam ex) and leave the full drives in an empty cabinet. I will use a 3rd external drive to transfer new data (video, images & project files) to my home workstation. For my home PC, I am adding 6 2TB drives and a Raid controller, so, I can have an exact duplicate of my studio 10TB raid array, and so it satisfies my off-site requirement. I have 6 2TB Seagate Constellation ES drives in my studio but they are 'enterprise-class' drives and cost $300 each; thus, I am trying to decide between Seagate 2TB Barracuda XT 64MB (7200rpm) @$200 each; Hitachi 2TB 32MB (7200rpm) @$130 each; and Seagate 2TB LP 32MB 5900rpm @$110 each. I don't like the Hitachi's for this because they consume a lot more power and generate more heat and the Seagate 5900rpm is almost as fast as the Hitachi but its random access is much slower plus I don't know how they would hold up in a Raid 5 array. Also, both Seagate 2TB drives come with a 5yr warranty whereas the Hitachi is only 3yrs. I am also trying to decide between an Areca 1680x (because I have one in my studio PC) and a 3ware 9750 because I have a 3ware 9650SE-8ML in my home PC. I am leaning towards the Areca for redundancy in case the Areca in the studio's PC dies. EDIT: I just read about Seagate's new 3TB external drives which can use USB2, USB3, FW800 and eSata. However, they only come with a 2yr warranty but are only $200 for the base USB2 model. Last edited by Steve Kalle; August 15th, 2010 at 02:53 PM.